I’m quite talented when it comes to posing for photos. 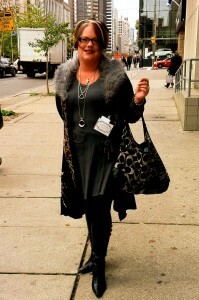 This one of me in the Fall at Blissdom Canada certainly shows all of my best sides. Yes friends, I am FABULOUS! It takes some effort to successfully layer and tilt the chin just so to hide the bulges which have appeared upon my lithe frame over the past 2 years. Every photo I see of myself which is taken candidly makes me cringe. I am determined to change how I look and how I feel. When you’re overweight it exasperates health issues and I’m sick of it. I began a healthy eating focus January 1st and will be using Wordless Wednesday to update my progress…even if it’s at the bottom of a post. 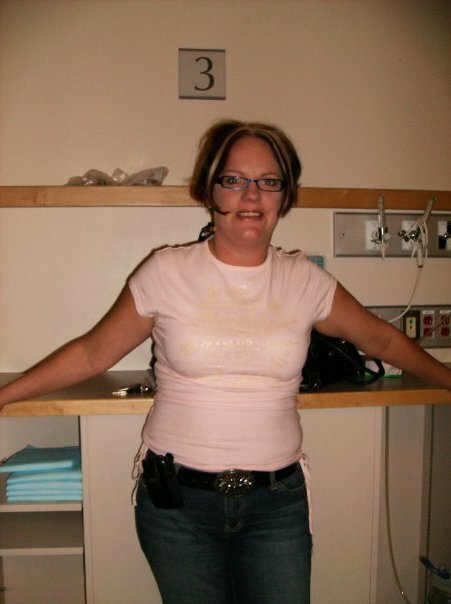 And so here is what I want to look and feel like, this was late 2008 and I was this size up into 2010. I was jogging regularly and while that’s out of my reach today I can control my eating habits and get daily exercise! You ARE fabulous, and motivation comes in many ways, including crazy photos of ourselves! You can do it, girlie. I have lost almost 25 lbs since May, and it feels great. I hope to lose about 20 more. Go Julie Go! You look fab! I understand what you mean about those dreaded photos that are taken when you aren’t aware & posing. They are rarely flattering! Good luck with your weight loss goals. I’m sure you can do it! I thought you looked great at Blissdom, however kudos to you for doing what makes you feel better about yourself. I’m on that train myself. You are such a beautiful person Julie! we will reach our goals together! you are definitely fab and I am right there with you with eating right and getting healthy! What funny perceptions we have of ourselves. I can hardly stand to have a camera pointed at me, but I think you are gorgeous and I was surprised to read you don’t like to have your picture taken. I’m eating healthy and exercising this year too. Hopefully we will both feel great! You are fab and lovely. But I hear you about health and wanting to feel better. I have about 30 pounds to lose to get to my comfortable weight, where I have good energy and can cut my toenails myself. But I have lacked the will power to stick to it. Maybe you can inspire me? First, you look totally smokin hot in that first photo. You should wear that outfit everyday. Good for you for starting the year off right. I plan to lose 25 lbs myself this Winter/Spring. Although it didn’t help that I just downed a handful of Hershey Kisses. But seriously, can you blame me? They’re Hershey Kisses!!!!! Oh Mark we all need those darned kisses!! I baked 6 dozen cookies with them over Christmas and ate 1/2 I think….Hence why I’m not a size 2 by now. That top photo is styling!!! While my daughter has been my salvation, she has also wrecked my once relatively smokin’ hot bod! This year for me, is about health. If I lose some weight by making healthier choices (like I make my daughter do) and being more active by playing…then so be it! :) it sure would be a plus! You’re lookin’ hot!! Love that outfit! Just linked up Hardly a Housewife, my first time joining your linky. you looked stunning at the fall conferences! stunning! Julie, I have to say that when I saw you at SCCTO, I was blown away. You just looked so fabulous! Thanks for sharing this post. It’s something I’ve been thinking about lately too. 2012 is going to be our year to shine, lady. You can do it!!! Christmas hit me HARD, so should I say I hit the sweets hard… And after hitting a weight last summer that I have not seen in years (and was so happy) I have been slowly creeping back up again. I totally need to get my but in gear too! Love that outfit. I NEVER look so pulled together. Candid shot or posed. I’m betting you’ll be jogging again in no time. I can remember seeing you at SCCTO and thought you were adorable. Good luck on your journey. I need to start one! Happy New Year. Kudos to you for being brave AND making a vow to get healthy! You ARE fabulous! Julie that is so awesome! I am also still on the journey to getting fit and I think using Wordless Wednesday to post how your doing is a fantastic idea, almost like a weekly check in. I may join you and be as brave and post a picture! Maybe we can give each other some positive support! I think this is something most of us, and definitely I, can relate to. Good for you for putting everything out here. 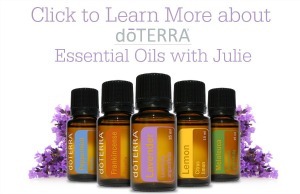 I’m sure 2012 will be the year you take back your body! OMG girl, lets get a support group going because since Blissdom, I’ve gained like 15 pounds and that’s tons on my frame and height. I need to do the same! Either way though, you are beautiful and the candid pictures that I have of you are fabulous, just sayin’! I look forward to seeing your updates and using you as my motivation! I have got to say you do indeed look fabulous in your Blissdom photo. But I totally get what you’re saying. Here’s to a fantastic 2012 and a body you feel comfy in. Best of luck lady. I so want to get into shape before Spring… k, maybe summer. Definitely by summer. I wish I had a walking buddy…. I’m back on track, too! Support each other, yes? I’m always afraid to set getting into shape goals for myself. Maybe I’ll get more motivation and courage by watching your progress. Good luck to you! You looked beautiful at Blissdom Julie! I loved that coat!! I need to get out walking but hate the winter..
You look gorg girl! Good luck on your adventure! You are so brave and I truly do admire you for what you are doing!